Tens of thousands of people thronged the streets of central London as the coffin bearing the body of Diana, Princess of Wales was taken by hearse from St James's Palace to her former home, Kensington Palace. Mourners held candles in silence as the hearse carrying the coffin draped in the Royal Standard emerged from the gates of St James's Palace. The coffin has been lying in the Chapel Royal at St James's since Sunday evening after being brought back from Paris. 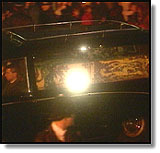 Prince Charles, Prince William and Prince Harry followed closely behind the hearse in a limousine. Some of the mourners lining the route threw flowers into the path of the hearse as it passed over roads still glistening from a shower of rain. Thousands of camera flashlights lit up the procession of four cars as it swept slowly past the floodlit Victoria Memorial and Buckingham Palace, which was silhouetted against the evening sky. 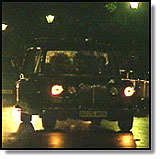 Members of Diana's family were in a car following the limousine carrying Charles, and behind that followed a limousine with three members of the clergy. The Princes looked straight ahead as they passed the waiting crowds, not glancing at them or at the flowers and candles which lit their way. As the coffin passed by followed by the motorcade, there was a smattering of applause from the crowd and some cries of "God bless you", but most people simply stood and stared in stunned silence. 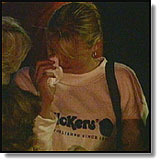 Onlookers wept openly as they witnessed the dramatic scenes. The hearse was engulfed by crowds as it approached Kensington Palace where police officers had to stand on guard to keep the road clear. Jenny James, a solicitor's clerk in her twenties from London, burst into tears at the sight of Diana's coffin lying in the back of the glass-sided hearse covered by a Royal Standard and with a bouquet of white lilies lying on top. She said: "It is so, so sad, so tragic. The coffin just seemed so small. I just came here to pay my last respects and I can't believe how much it's shaken me up." Mark Williams, 45, from Cardiff, said: "It is just appalling to see the coffin actually lying there. Until this moment, I don't think I really believed that she was dead." Wolfgang Kox, 49, a businessman visiting from Germany, was impressed by the calm and respectful atmosphere as the hearse passed by. "It was a very solemn occasion. It was amazing to see people weeping and crying openly. The calmness with which people are taking all of this is remarkable."